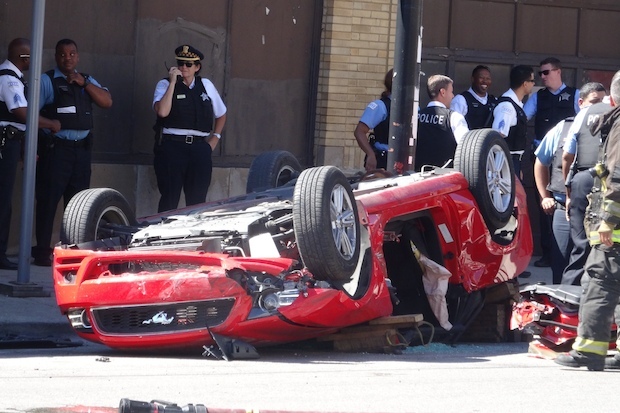 CHICAGO — Two men were injured in a car crash following a brief police chase in South Shore Wednesday morning, authorities said. About 10:30 a.m., police responded to a call of shots fired near East 79th Street and South Saginaw Avenue, said Officer Veejay Zala, a police spokesman. An officer spotted two men in a red sports car near the scene. As the officer approached on foot, the car's driver attempted to run the officer over, Zala said. The officer fired at the car but did not hit either of the men, Zala said. The men fled the scene but crashed three blocks east in the 7900 block of South Essex Avenue. The car apparently flipped over when it crashed. Both men were arrested and taken to area hospitals to be treated for injuries from the crash, Zala said. A firearm was allegedly recovered from the car. Police said neither of the men's injuries appear to be life-threatening, and no officers were injured in the encounter. No one else suffered injuries during the incident, police said. "It was really a good case of a police officer doing what she was supposed to do," said Pat Camden, a police union spokesman. Camden said the officer spotted the red sports car matching the description from the call of shots fired stopped at the train tracks. After she tried to make an arrest, the car's driver tried to run over the officer twice, causing her to fire on the car, Camden said. CTA buses were temporarily rerouted around 79th Street and Essex Avenue, where the driver's red Ford Mustang had flipped over during the crash.